Part of your world like never before! 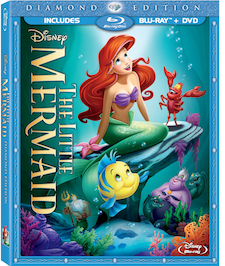 BURBANK, CA, June 14, 2013 – This October 1, The Walt Disney Studios animated classic The Little Mermaid becomes a part of our world like never before as an all-new Diamond Edition release. To celebrate the return of the movie that gave voice to a whole generation, Disney has teamed up with the voice of a new generation, Grammy®-nominated music superstar Carly Rae Jepsen, to record a new version of The Little Mermaid’s beloved song “Part of Your World,” which will appear as a music video on the upcoming Diamond Edition Blu-ray™ Combo Pack releases. In addition to the new music video “Part of Your World” featuring Ms. Jepsen, The Little Mermaid Diamond Edition Blu-ray Combo Pack includes a cavern of other wondrous bonus feature treasures. Viewers can experience the film in high definition Blu-ray 3D™, Blu-ray and High Definition Digital platforms. Ariel, a fun-loving mermaid, is off on the adventure of a lifetime with her best friend, the adorable Flounder, and the reggae-singing Caribbean crab Sebastian at her side. But it will take all of her courage and determination to make her dreams come true — and save her father’s beloved kingdom from the sneaky sea witch Ursula! For more than 85 years, The Walt Disney Studios has been the foundation on which The Walt Disney Company was built. Today, the Studio brings quality movies, music and stage plays to consumers throughout the world. Feature films are released under the following banners: Disney, including Walt Disney Animation Studios and Pixar Animation Studios; Disneynature; Marvel Studios; and Touchstone Pictures, the banner under which live-action films from DreamWorks Studios are distributed. The Disney Music Group encompasses the Walt Disney Records and Hollywood Records labels, as well as Disney Music Publishing. The Disney Theatrical Group produces and licenses live events, including Disney on Broadway, Disney On Ice and Disney Live!.